Modeling is not science. Take Professor Ray Fair, for example. He teaches macroeconomic theory, econometrics, and macroeconometric models at Yale University. He has been plying his trade since 1968, first at Princeton, then at M.I.T., and (since 1974) at Yale. Those are big-name schools, so I assume that Prof. Fair is a big name in his field. 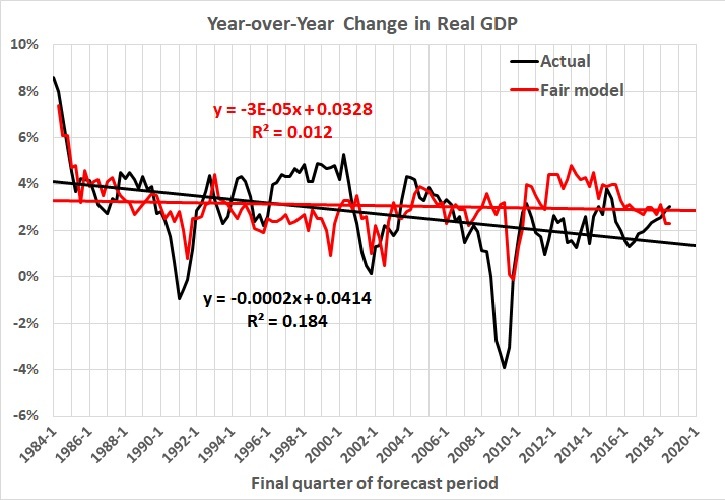 Well, since 1983 Professor Fair has been forecasting changes in real GDP four quarters ahead. He has made dozens of forecasts based on a model that he has tweaked many times over the years. The current model can be found here. His forecasting track record is here. 1. The mean absolute error of his forecasts is 70 percent; that is, on average his predictions vary by 70 percent from actual rates of growth. 2. The median absolute error of his forecasts is 33 percent. 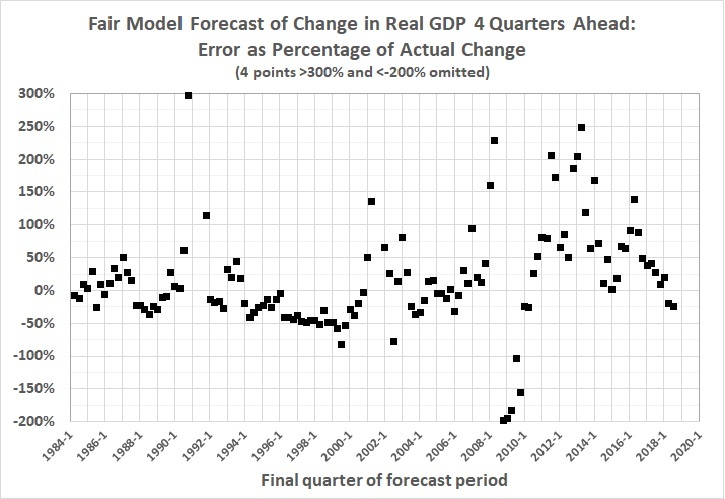 Figures 1-4 are derived from The Forecasting Record of the U.S. Model, Table 4: Predicted and Actual Values for Four-Quarter Real Growth, at Fair’s website. Given the foregoing, you might think that Fair’s record reflects the persistent use of a model that’s too simple to capture the dynamics of a multi-trillion-dollar economy. But you’d be wrong. The model changes quarterly. This page lists changes only since late 2009; there are links to archives of earlier versions, but those are password-protected. As for simplicity, the model is anything but simple. For example, go to Appendix A: The U.S. Model: July 29, 2016, and you’ll find a six-sector model comprising 188 equations and hundreds of variables. Could I do better? Well, I’ve done better, with the simple model that I devised to estimate the Rahn Curve. 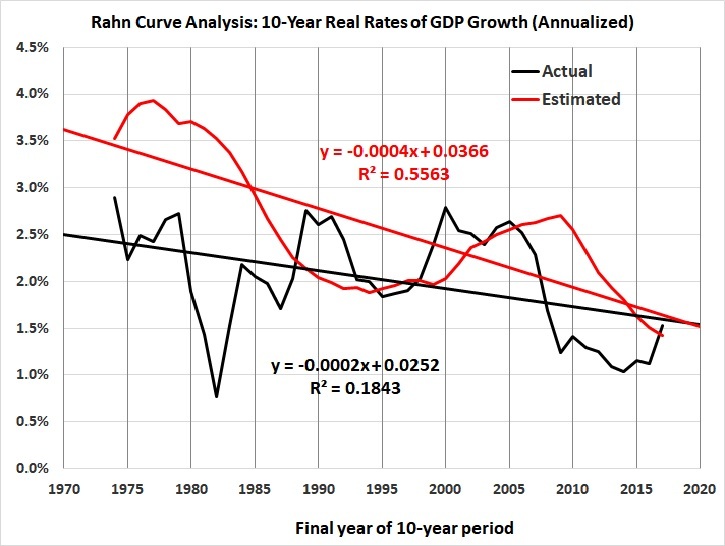 It’s described in “The Rahn Curve in Action“, which is part III of “Economic Growth Since World War II“. The curve is dashed rather than solid at low values of government spending because it has been decades since the governments of developed nations have spent as little as 20 percent of GDP. But as Mitchell and others note, the combined spending of governments in the U.S. was 10 percent (and less) until the eve of the Great Depression. And it was in the low-spending, laissez-faire era from the end of the Civil War to the early 1900s that the U.S. enjoyed its highest sustained rate of economic growth. To be precise, it’s the annualized rate of growth over the most recent 10-year span (Yg), as a function of F (fraction of GDP spent by governments at all levels) in the preceding 10 years. The relationship is lagged because it takes time for government spending (and related regulatory activities) to wreak their counterproductive effects on economic activity. Also, I include transfer payments (e.g., Social Security) in my measure of F because there’s no essential difference between transfer payments and many other kinds of government spending. They all take money from those who produce and give it to those who don’t (e.g., government employees engaged in paper-shuffling, unproductive social-engineering schemes, and counterproductive regulatory activities). When F is greater than the amount needed for national defense and domestic justice — no more than 0.1 (10 percent of GDP) — it discourages productive, growth-producing, job-creating activity. And because government spending weighs most heavily on taxpayers with above-average incomes, higher rates of F also discourage saving, which finances growth-producing investments in new businesses, business expansion, and capital (i.e., new and more productive business assets, both physical and intellectual). I’ve taken a closer look at the post-World War II numbers because of the marked decline in the rate of growth since the end of the war (Figure 2). P = growth in the CPI-U during the preceding 10 years (annualized). The r-squared of the equation is 0.74 and the F-value is 1.60E-13. The p-values of the intercept and coefficients are 0.093, 3.98E-08, 4.83E-09, 6.05E-07, and 0.0071. The standard error of the estimate is 0.0049, that is, about half a percentage point. What does the new equation portend for the next 10 years? Based on the values of F, A, R, and P for 2008-2017, the real rate of growth for the next 10 years will be about 2.0 percent. There are signs of hope, however. The year-over-year rate of real growth in the four most recent quarters (2017Q4 – 2018Q3) were 2.4, 2.6, 2.9, and 3.0 percent, as against the dismal rates of 1.4, 1.2, 1.5, and 1.8 percent for four quarters of 2016 — Obama’s final year in office. A possible explanation is the election of Donald Trump and the well-founded belief that his tax and regulatory policies would be more business-friendly. For ease of comparison, I made the scale of the vertical axis of figure 5 the same as the scale of the vertical axis of figure 2. 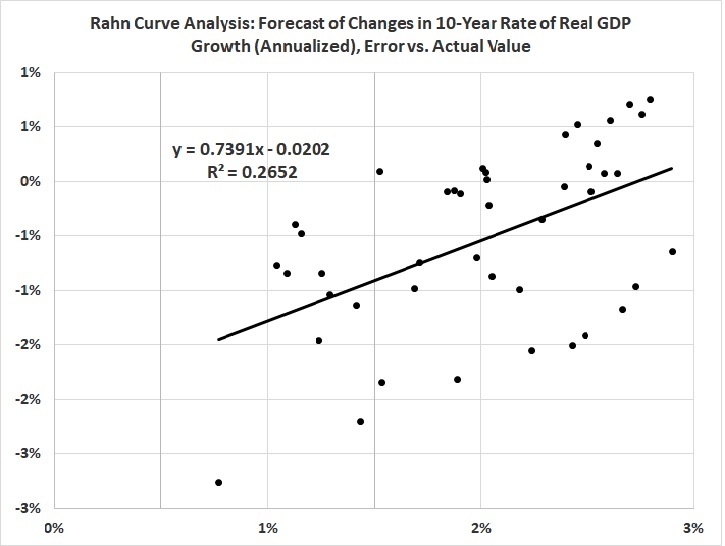 It’s obvious that my estimate of the Rahn Curve does a much better job of predicting the real rate of GDP growth than does Fair’s model. The systematic bias reflected in figure 6 is far weaker than the systematic bias in Fair’s estimates (figure 1). The moral of the story: It’s futile to build complex models of the economy. They can’t begin to capture the economy’s real complexity, and they’re likely to obscure the important variables — the ones that will determine the future course of economic growth. A final note: Elsewhere (e.g., here) I’ve disparaged economic aggregates, of which GDP is the apotheosis. And yet I’ve built this post around estimates of GDP. Am I contradicting myself? Not really. There’s a rough consistency in measures of GDP across time, and I’m not pretending that GDP represents anything but an estimate of the monetary value of those products and services to which monetary values can be ascribed. As a practical matter, then, if you want to know the likely future direction and value of GDP, stick with simple estimation techniques like the one I’ve demonstrated here. Don’t get bogged down in the inconclusive minutiae of a model like Professor Fair’s. For a full explanation, go to III. The Rahn Curve in Action. This is the fifth entry in a series of loosely connected posts on economics. Previous entries are here, here, here, and here. In the the previous post I disparaged the ability of economists to estimate the employment effects of the minimum wage. 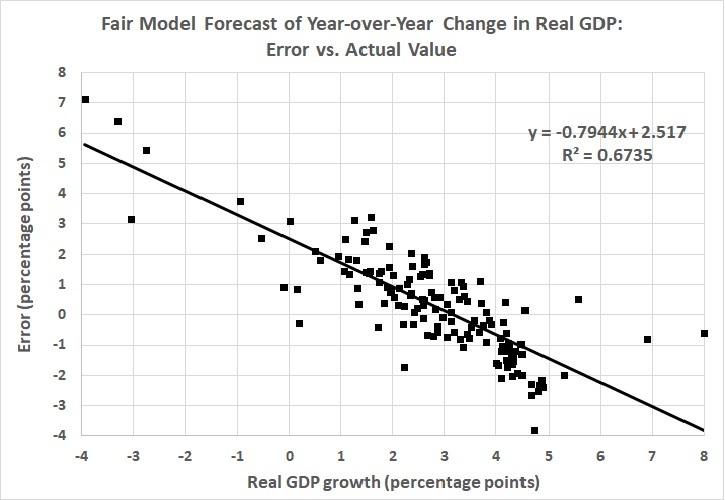 I’m skeptical because economists are notoriously bad at constructing models that adequately predict near-term changes in GDP. That task should be easier than sorting out the microeconomic complexities of the labor market. Take Professor Ray Fair, for example. Prof. Fair teaches macroeconomic theory, econometrics, and macroeconometric models at Yale University. He has been plying his trade since 1968, first at Princeton, then at M.I.T., and (since 1974) at Yale. Those are big-name schools, so I assume that Prof. Fair is a big name in his field. 1. The median absolute error of his forecasts is 30 percent. 2. The mean absolute error of his forecasts is 70 percent. 3. His forecasts are rather systematically biased: too high when real, four-quarter GDP growth is less than 4 percent; too low when real, four-quarter GDP growth is greater than 4 percent. 4. His forecasts have grown generally worse — not better — with time. 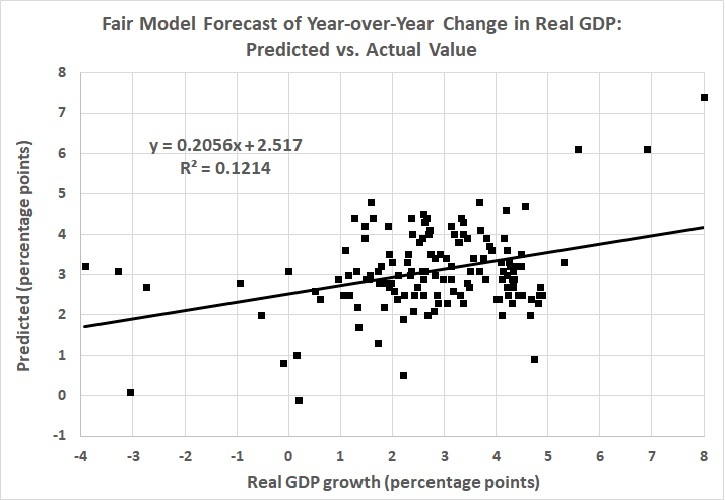 This and later graphs pertaining to Prof. Fair’s forecasts were derived from The Forecasting Record of the U.S. Model, Table 4: Predicted and Actual Values for Four-Quarter Real Growth, at Prof. Fair’s website. The vertical axis of this graph is truncated for ease of viewing; 8 percent of the errors exceed 200 percent. You might think that Fair’s record reflects the persistent use of a model that’s too simple to capture the dynamics of a multi-trillion-dollar economy. But you’d be wrong. The model changes quarterly. This page lists changes only since late 2009; there are links to archives of earlier versions, but those are password-protected. To be precise, it’s the annualized rate of growth over the most recent 10-year span (G), as a function of F (fraction of GDP spent by governments at all levels) in the preceding 10 years. The relationship is lagged because it takes time for government spending (and related regulatory activities) to wreak their counterproductive effects on economic activity. Also, I include transfer payments (e.g., Social Security) in my measure of F because there’s no essential difference between transfer payments and many other kinds of government spending. They all take money from those who produce and give it to those who don’t (e.g., government employees engaged in paper-shuffling, unproductive social-engineering schemes, and counterproductive regulatory activities). The r-squared of the equation is 0.73 and the F-value is 2.00E-12. The p-values of the intercept and coefficients are 0.099, 1.75E-07, 1.96E-08, 8.24E-05, and 0.0096. The standard error of the estimate is 0.0051, that is, about half a percentage point. (Except for the p-value on the coefficient, the other statistics are improved from the previous version, which omitted CPI). The equation with P captures the “bump” in 2000, and is generally (though not always) closer to the mark than the equation without P.
What does the new equation portend for the next 10 years? Based on the values of F, A, R, and P for the most recent 10-year period (2006-2015), the real rate of growth for the next 10 years will be about 1.9 percent. (It was 1.4 percent for the version of the equation without P.) The earlier equation (discussed above) yields an estimate of 2.9 percent. The new equation wins the reality test, as you can tell by the blue line in the second graph above. In fact the year-over-year rates of real growth for the past four quarters (2015Q3 through 2016Q2) are 2.2 percent, 1.9 percent, 1.6 percent, and 1.3 percent. So an estimate of 1.9 percent for the next 10 years may be optimistic. The errors get larger with time, but they are far smaller than the errors in Fair’s model (see figure 1). A final note: In earlier posts I’ve disparaged economic aggregates, of which GDP is the apotheosis. And yet I’ve built this post around estimates of GDP. Am I contradicting myself? Not really. There’s a rough consistency in measures of GDP across time, and I’m not pretending that GDP represents anything but an estimate of the monetary value of those products and services to which monetary values can be ascribed. As a practical matter, then, if you’re a person who wants to know the likely future direction and value of GDP, stick with simple estimation techniques like the one I’ve demonstrated here. Don’t get bogged down in the inconclusive minutiae of a model like Prof. Fair’s. 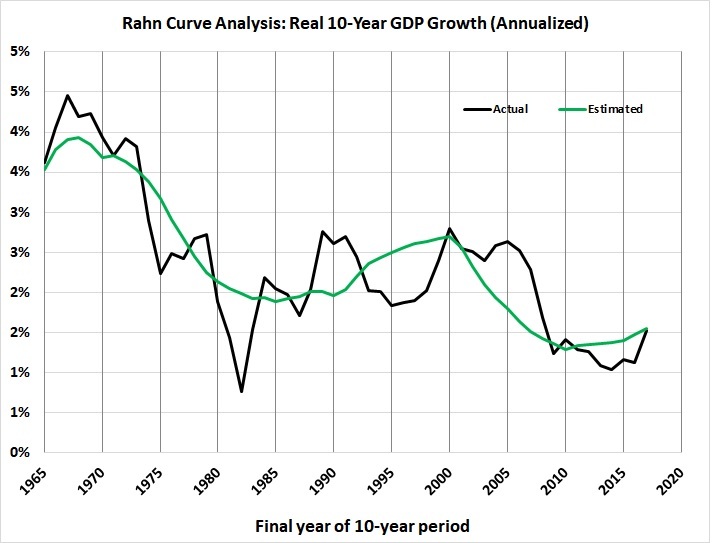 REVISED 10/18/16, to report a new estimate of the Rahn curve after correcting a slight error in the previous estimate. REVISED 10/20/16, to add a fourth explanatory variable, which improves the fit of the equation. And it probably is. 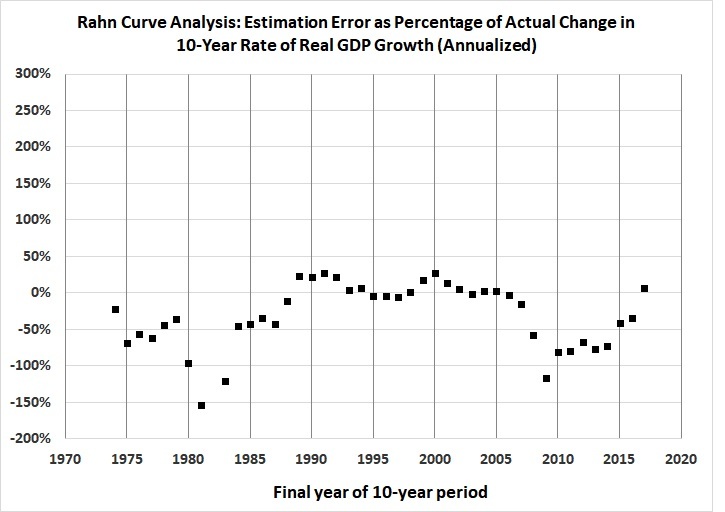 If F were to rise from 0.382 (the average for 2006-2015) to 0.438, the rate of real growth would fall to zero, even if A, R, and P were to remain at their 2006-2015 levels. (And R is much more likely to rise than to fall.) It’s easy to imagine F hitting 0.438 with a Democrat president and Democrat-controlled Congress mandating “free” college educations, universal “free” health care, and who knows what else. UPDATED 12/13/14 — This update consists of a comment about my estimate of the Rahn curve. I have just published a much better estimate of the curve for the post-World War II era. UPDATED 12/28/11 — This update incorporates GDP and government spending statistics for 2010 and corrects a minor discrepancy in the estimation of government spending. Also, there are new, easier-to-read graphs. The bottom line is the same as before: Government spending and everything that goes with it (including regulation) is destructive of economic growth. UPDATED 09/19/13 — This version incorporates two later posts “Estimating the Rahn Curve: A Sequel” (01/24/12) and “More Evidence for the Rahn Curve” (05/27/12). The regression lines are there simply to emphasize the long-term trends. The relationship between government spending as a percentage of GDP (G/GDP) and real GDP growth will emerge from the following graphs. There are chronological gaps because the Civil War, WWI, the Great Depression, and WWII distorted the relationship between G/GDP and economic growth. Large wars inflate government spending and GDP. The Great Depression saw a large rise in G/GDP, by pre-Depression standards, even as the economy shrank and then sputtered to a less-than-full recovery before the onset of WWII. There are at least five plausible — and not mutually exclusive — explanations for the discrepancy. First, there is the difficulty of estimating GDP for years long past. Second, it is almost impossible to generate a consistent estimate of real GDP spanning two centuries; current economic output is vastly greater in volume and variety than it was in the early days of the Republic. Third, productivity gains (advances in technology, management techniques, and workers’ skills) may offset the growth-inhibiting effects of government spending, to some extent. Fourth, government regulations and active interventions (e.g., antitrust activity, the income tax) have a cumulative effect that operates independently of G/GDP. Regulations and interventions may have had an especially strong effect in the early 1900s (see the second graph in this post). The effects of regulations and interventions may diminish with time because of adaptive behavior (e.g., “capture” of regulatory bodies). Finally, and perhaps most importantly, there is the shifting composition of government spending. At relatively low levels of G/GDP, G consists largely of government programs that usurp and interfere with private-sector functions by diverting resources from productive uses to uses favored by politicians, bureaucrats, and their patrons. Higher levels of G/GDP — such as those we in the United States have known since the end of WWII — are reached by the expansion of the welfare state. Government spending (at all levels) on so-called social benefits accounted for only 7 percent of G and 0.8 percent of GDP in 1929; in 2009, it accounted for 36 percent of G and 15 percent of GDP. The provision of “social benefits” brings government into the business of redistributing income, which discourages work, saving, and capital formation to some extent, but doesn’t impinge directly on commerce. Therefore, I would expect G to be less damaging to GDP growth at higher levels of G/GDP — which is the message to be found in the contrast between the experience of 1946-2009 and the experience of earlier periods. The intermediate points, unfortunately, are missing because of the chronological gaps mentioned above. But, as indicated by the five earlier graphs, it is entirely reasonable to infer from the preceding graph a strong relationship between GDP growth and changes in G/GDP throughout the history of the Republic. My rough estimate is appropriately “fuzzy” and somewhat more generous than Daniel Mitchell’s, which is indicated by the heavy black line. In light of my discussion of the shifting composition of G as G/GDP becomes relatively large, I have followed the slope of the trend line for 1792-2010; that is, every 1 percentage-point increase in G/GDP yields a decrease in the growth rate of about 0.07 percent. That seemingly small effect becomes a huge one when G/GDP rises over a long period of time (as has been the case for more than a century, with no end in sight). Annual rate of growth = -0.066(G/GDP) + 0.054. Again, it’s the annualized rate of growth over a 10-year span, as a function of G/GDP (fraction of GDP spent by governments at all levels) in the preceding 10 years. The new term, BA/GDP, represents the constant-dollar value of private nonresidential assets (i.e., business assets) as a fraction of GDP, averaged over the preceding 10 years. The idea is to capture the effect of capital accumulation on economic growth, which I didn’t do in the earlier analysis. If G/GDP reaches 55 percent — which it will if present entitlement “commitments” are not curtailed — the “baseline” rate of growth will shrink further: probably to less than 2 percent. And thus America will remain mired in its Mega-Depression. Estimates of real and nominal GDP, back to 1790, come from the feature “What Was the U.S GDP Then?” at MeasuringWorth.com. Estimates of government spending (federal, State, and local) come from USgovernmentspending.com; Statistical Abstracts of the United States, Colonial Times to 1970: Part 2. Series Y 533-566. Federal, State, and Local Government Expenditures, by Function; and the Bureau of Economic Analysis (BEA), Table 3.1. Government Current Receipts and Expenditures (lines 34, 35). I found the amount spent by governments (federal, State, and local) on national defense and public order and safety by consulting BEA Table 3.17. Selected Government Current and Capital Expenditures by Function. The BEA tables cited above are available here. In the original post (above) I note that maximum GDP growth occurs when government spends two to four percent of GDP. The two-to-four percent range represents the share of GDP claimed by American governments (federal, State, and local) throughout most of the 19th century, when government spending exceeded five percent of GDP only during the Civil War. Of course, until the early part of the 20th century, when Progressivism began to make itself felt in Americans’ tax bills, governments restricted themselves (in the main) to the functions of national defense, public order, and safety — the terms used in national-income accounting. It is those functions — hereinafter called defense and justice — that foster liberty and economic growth because they protect peaceful, voluntary activity. Effective protection probably would cost more than four percent of GDP in these parlous times. But an adequate figure, except in the rare event of a major war, is probably no more than seven percent of GDP — the value for 2010, which includes the cost of fighting in Iraq and Afghanistan. My rough estimate is appropriately “fuzzy” and somewhat more generous than Daniel Mitchell’s [in “The Impact of Government Spending on Economic Growth”], which is indicated by the heavy black line. In light of my discussion of the shifting composition of G as G/GDP becomes relatively large, I have followed the slope of the trend line for 1792-2010; that is, every 1 percentage-point increase in G/GDP yields a decrease in the growth rate of about 0.06 percent. That seemingly small effect becomes a huge one when G/GDP rises over a long period of time (as has been the case for more than a century, with no end in sight). A note about my measure of government spending is in order. National-income accounting purists would insist that transfer payments (mainly Social Security, Medicare, and Medicaid) should not count as spending, even though I count them as such. But what does it matter whether money is taken from taxpayers and given to retired persons (as Social Security) or to government employees (as salary and benefits) or contractors (as reimbursement for products and services delivered to government)? All government spending represents the transfer of claims on resources from persons who earned those claims to other persons, who either did something of questionable value for the money (government employees and contractors) or nothing (e.g., retirees). What is the Mega-Depression? It is a measure of the degree to which real GDP has fallen below what it would have been had economic growth continued at its post-Civil War pace. As I explain here, the Mega-Depression began in the early 1900s, when the economy began to sag under the weight of Progressivism (e.g., trust-busting, regulation, the income tax, the Fed). Then came the New Deal, whose interventions provoked and prolonged the Great Depression (see, for example, this, and this). From the New Deal and the Great Society arose the massive anti-market/initiative-draining/dependency-promoting schemes known as Social Security, Medicare, and Medicaid. The extension and expansion of those and other intrusive government programs has continued unto the present day (e.g., Obamacare), with the result that our lives and livelihoods are hemmed in by mountains of regulatory restrictions. Regulation aside, government spending — except for defense and justice — is counterproductive. Not only does it fail to stimulate the economy in the short run, but it also robs the economy of the investments that are needed for long-run growth. [W]e have some new research from the United Kingdom. The Centre for Policy Studies has released a new study, authored by Ryan Bourne and Thomas Oechsle, examining the relationship between economic growth and the size of the public sector. The chart above compares growth rates for nations with big governments and small governments over the past two decades. The difference is significant, but that’s just the tip of the iceberg. The most important findings of the report are the estimates showing how more spending and more taxes are associated with weaker performance. Here are some key passages from the study. Using tax to GDP and spending to GDP ratios as a proxy for size of government, regression analysis can be used to estimate the effect of government size on GDP growth in a set of countries defined as advanced by the IMF between 1965 and 2010. …As supply-side economists would expect, the coefficients on the tax revenue to GDP and government spending to GDP ratios are negative and statistically significant. This suggests that, ceteris paribus, a larger tax burden results in a slower annual growth of real GDP per capita. Though it is unlikely that this effect would be linear (we might expect the effect to be larger for countries with huge tax burdens), the regressions suggest that an increase in the tax revenue to GDP ratio by 10 percentage points will, if the other variables do not change, lead to a decrease in the rate of economic growth per capita by 1.2 percentage points. The result is very similar for government outlays to GDP, where an increase by 10 percentage points is associated with a fall in the economic growth rate of 1.1 percentage points. This is in line with other findings in the academic literature. …The two small government economies with the lowest marginal tax rates, Singapore and Hong Kong, were also those which experienced the fastest average real GDP growth. every 1 percentage-point increase in G/GDP yields a decrease in the growth rate of about 0.07 percent. That seemingly small effect becomes a huge one when G/GDP rises over a long period of time (as has been the case for more than a century, with no end in sight). In other words, every 10 percentage-point increase in the ratio of government spending to GDP causes a not-insignificant drop of 0.7 percentage points in the rate of growth. That is somewhat below the estimate quoted above (1.1 percentage points), but surely it is within the range of uncertainty that surrounds the estimate. I was pleased to read a recent post by Mark Perry, “Federal regulations have lowered real GDP growth by 2% per year since 1949 and made America 72% poorer.” It wasn’t the message that pleased me; it was the corroboration of what I have been saying for several years. Regulation is one of the many counterproductive activities that is financed by government spending. The main economic effect of government spending, aside from regulation, is the deadweight loss it imposes on the economy; that is, it moves resources from productive uses to less productive, unproductive, and counterproductive ones. And then there is taxation (progressive and otherwise), which penalizes success and deters growth-producing investment. All in all, the price of government is extremely high. But most voters are unaware of the price, and so they continue to elect and support the very “free lunch” politicians who are, in fact, robbing them blind. Pethokoukis’s thesis, with which I agree, is that government — not lack of opportunity — is the main obstacle to the resumption of a high rate of growth. 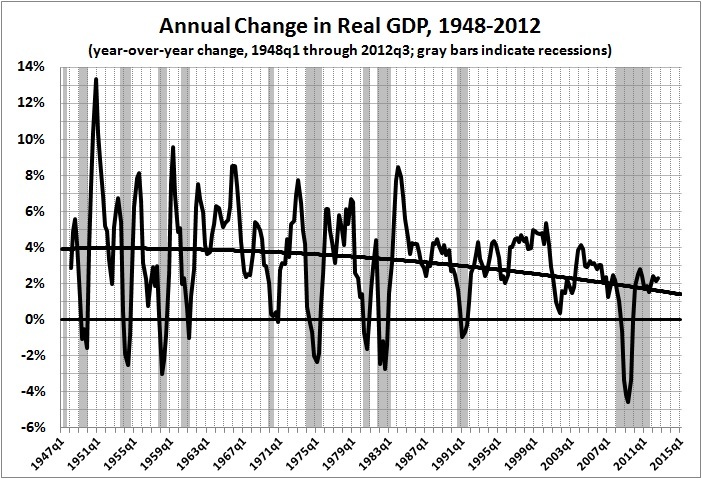 in anticipation of slower economic growth, stock prices will continue to decline, in real terms. We are now on the downside of the fifth cycle, which began in July 1982 and peaked in August 2000. If the present cycle follows the pattern of the other two long cycles, it may not bottom out until sometime after 2020 (though it may never end if economic growth continues to decline). And if it does bottom out then, the real value of the S&P composite will have risen only about two-fold from where its value at the start of the cycle in July 1982. In nominal terms, the S&P Composite will have dropped to about half its current level by 2020. But, as I say, the stock market merely anticipates underlying economic conditions. Those conditions seem destined to worsen because the entitlements mess will not be dealt with for as long as there is gridlock in Washington. * See also the second graph in this post by James Pethokoukis of the American Enterprise Institute. The graph highlights the inverse relationship between entitlement spending and growth-producing innovation. Entitlement spending diminishes investments in innovation by (a) diverting resources from productive to unproductive uses and (b) penalizing (taxing) productive activities that fund innovation and its implementation. Here. The bottom line: still stuck in a rut, thanks to Obama-nomics. The advance estimate of GDP for the third quarter of 2012 has been released. Real growth continues to slog along at about 2 percent. I have updated the graph, but the text needs no revision. The claims by Obama and his retinue about O’s supposed “rescue” of the economy from the abyss of depression are ludicrous. (See, for example, “A Keynesian Fantasy Land,” “The Keynesian Fallacy and Regime Uncertainty,” “Why the “Stimulus” Failed to Stimulate,” “Regime Uncertainty and the Great Recession,” The Real Multiplier,” “The Real Multiplier (II),”The Economy Slogs Along,” and “The Obama Effect: Disguised Unemployment.”) Nevertheless our flannel-mouthed president his sycophants insist that he has done great things for the country, though the only great thing that he could do is to leave it alone. Obama is not to blame for the Great Recession, but the sluggish recovery is due to his anti-business rhetoric and policies (including Obamacare, among others). All that Obama can rightly take “credit” for is an acceleration of the downward trend of economic growth. Are We Mortgaging Our Children’s Future? This post is now on a page of its own. J.D. Foster and Curtis Dubay, writing at The Foundry (“Of Course Higher Taxes Slow Growth — A Response to Diamond and Saez“), make mincemeat of Peter Diamond and Emmanuel Saez’s arguments for higher taxes on “the rich.” Implicit in Foster and Dubay’s takedown of Diamond and Saez is the demonstrably strong (and negative relationship) between government spending and economic growth. Spending is funded by taxes, after all. And even when spending is funded by borrowing it amounts to a tax on the productive sectors of the economy. How is that? When government sell bonds to the public it redirects money from productive uses in the private sector to unproductive and counter-productive uses in the so-called public sector (i.e., government). The thievery is no less destructive — but more apparent — when the Fed creates money out of thin air to finance government spending. The bottom line is that for every 10 percentage points by which government spending rises, the rate of growth declines by 0.7 percentage points. If you think that 0.7 percent is negligible, try compounding it over a lifespan of 80 years. In that time, a sustained 10 percent rise in government spending will reduce the average person’s real income by more than 40 percent. That, my friends, is soak-the-rich Obamanomics at work. Apologists for Obamanomics, like Diamond and Saez, should be ashamed of themselves for abetting economically destructive demagoguery.